On 10 June 1944, American fighter pilot Herbert "Stub" Hatch, flying one of the 16 P-38Js, of the 71st Fighter Squadron, took off from Foggia, in Italy, before dawn. In an effort to inflict decisive damage on the Ploiesti oilfields, 46 bomb-carrying P-38Js of the 82nd FG, escorted by a similar number of long-range Lightning fighters of the 1st FG, attempted to intrude into Romania undetected. Freya and Wiirzburg radar chain picked up the faint signal of the low-flying formation prior to it entering Romanian airspace. Thanks to this early warning, the “Tiger” fighter command post alerted both Romanian and German units of the imminent attack. All combat-ready Romanian aircrafts were hastily scrambled. The Germans scrambled 64 Bf 109Gs and two FW 190s. As an unsuspecting “Stub” Hatch approached Popesti-Leordeni airfield, his formation was bounced from above by a large formation of Romanian Focke-Wulfs 190s and a vicious dogfight followed. Several Lightnings fell victim to the Romanian guns in that first pass, while others, trying to maneuver at low altitude, either hit the ground or the P-38 beside them. Only a few actually managed to engage the Romanian fighters. Grupul 6 Vanatoare emerged as the clear winners of this melee, its 23 pilots claiming an identical number of P-38s destroyed. The total number of enemy aircraft confirmed destroyed on 10 June was 18 downed by fighters and seven by flak defenses, with the destruction of three more being shared between gunners on the ground and Axis fighters. It was the highest loss ratio for any mission flown by a significant number of P-38s in World War II. The quoted testimony above is quite an accurate account of what have happened on 10 June 1944 above Popesti-Leordeni, safe one detail. There was no “large formation of Romanian FW 190s”. As the war records show, on that day were flown operationally only two such machines and over a different area. This is only one of the erroneous encounter reports about FW 190s. From 1941 to 1945 Russian, Hungarian, and German pilots often indicated engagements with “strangely painted FW 190s acting hostile” where there were no Focke Wulfs. Were those people having collective hallucinations or what? The explanation is much simpler. The “culprit” generating confusion is the clean looking, nimble and elegant Romanian designed and Romanian flown IAR 80/81 aircraft. 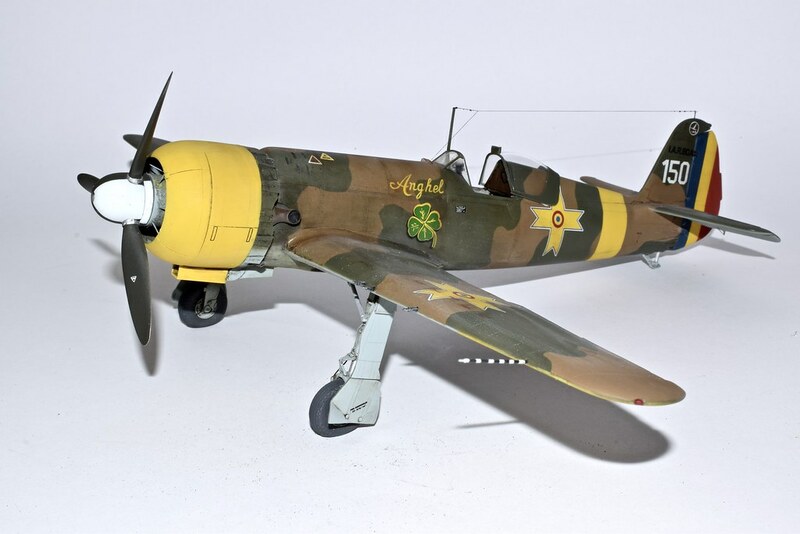 Now one of the “forgotten aircraft”, also dubbed “The Elegant Romanian”, or “The Prodigy Child of Romanian Aeronautics”, IAR 80/81 had its days of glory, especially over the Eastern Front. The release of a decent IAR 80/81 in quarter scale kit was long overdue. There were several attempts by small resin and plastic manufacturers, mostly in 1/72nd scale, but all lacking in detail and – most important – fuselage, wings and landing gear accuracy. Personally, I was expecting a release from Eduard which have issued several excellent Avia models or from Special Hobby, which have released a 1/32nd scale IAR 80 “Romanian Defender”. But it wasn’t to be. The surprise came from Hobby Boss. The “Romanian IAR-80” in 1/48 scale was on the market at the end of 2016, for the great enjoyment of Romanian modeling community. Apparently that was an inspired move by Hobby Boss. I missed the first stock by a few days, I bought one from the second stocking (which is the subject of the present review) and I’m waiting now for the third re-stocking (C’mon, guys, c’mon!) to build it differently. I think that says it all. 2.1. The Box The kit is boxed in a sturdy box with separate lid. The art box is very attractive, depicting an IAR 80, White 42 with 13 victory marks banking to engage a Soviet “Rata”. The sides and the ends of the box are depicting details of the contents, as well as the two proposed painting schemes. 2.2. The Sprues Under the lid, the parts are exquisitely packaged: all sprues in individually sealed plastic bags, two of them protected by spongy wrap. Big bravo, Hobby Boss! Sprue A (x1) contains the interior, fuselage halves, propeller, and cowling halves. Sprue B (x1) delivers the wings, stabilizers and the rudder. Sprue C (x1) carries the well detailed engine, correct hexagonal landing gear and ailerons. Sprue C is one of the sponge wrapped one, to protect the delicate engine parts. All styrene parts have excellent crisp detail and minimal flash if any. The injection gates are well placed, allowing clean cutting. The gray styrene is of a strong sort, required by the thinness of the parts. Even the large parts are almost unbelievable thin, nearly translucent. The surface texture of the plastic is satin-like, offering a very good adherence to the paint. What can I say more? As engineering, the kit is as close to perfection as it can be. Sprue GP (x1) is molded in clear plastic and comprises the canopy halves and the deflector sight. It comes protected in its own plastic bag and wrapped in sponge sheet. The plastic is absolutely clear and free of distortion and the paintable area of the canopy has the same satin finish as the styrene parts! Maybe they are a little too thick, but the excellent transparency compensates for thickness. 2.3. Photo etched fret (x1) carries only 5 unpainted parts: the map holder and the seatbelts. The finishing on those is also superbly done. 2.4. Decal sheet (x1) offers marking options for two aircraft from the 8th respectively 9th Fighter Group in 1941 (white 42 and white 137). But… Oh, my! The good news are finishing here. The first thing I noted it was the strangely marbled surface of the decals and the thick shiny carrier film. The blue is printed off the mark and way too dark. The stencils (in Romanian) are misspelled. More about decals later, under the Painting, Marking and Weathering chapter. 2.5. Instructions Manual It comes in form of an 8 A4 pages booklet, neatly laid and printed in grayscale. The cover page has printed on it a black and white reproduction of the artwork from the lid and, the warnings, used symbols decoding and the method to apply decals. The second page shows clearly the box contents diagrams. Pages 3 to 8 are dealing with the 12 three-dimensionally rendered construction steps, very easy to read and impeccably detailed. 2.6. Marking and Painting guide is delivered as an A4 both side print in full color. The quality of the print is impressive. First marking option shows White 42 of 8th FG with 13 victory marks on the port side of the rudder, two color camouflage, and Eastern front markings. The second option depicts White 137, with the clover leaf insignia of 9th FG. On the lower right corner of the marking guide is a color table with color description and references to Mr. Hobby, Vallejo, Model Master, Tamiya and Humbrol. Impressively again, the first painting option shows even the worn out areas, while the second option, photographed in pristine condition, has none! But… diving into the color schemes, I started finding mistakes. I chose the White 137 and I’m detailing here that scheme by comparison with the original wartime picture. The propeller hub is not yellow, as shown in the painting guide. The original print shows a darker color and another one of the same series aircraft from the same period shows a two color hub, probably a squadron identification code in within the group. Although I cannot say based on a black and white photograph only, I’m guessing the identification colors were red/black and blue/black. The numeral “137” is also wrong. The elegantly curved font offered by Hobby Boss has nothing in common with the squared numerals used by Romanians. Unfortunately, I’ve seen that only when I was applying the decals and I let it go (I still feel sorry about it!). The suggested positioning of decals 4 and 11 is also wrong. The guide shows them clustered around Michael’s Cross on the upper surface of the wings, but they should be placed more towards the root of the wings, respectively decal 11 over the MG servicing panel and decal 4 (x3) over the ammunition loading panels. To add insult to injury, the Romanian word MITRALIERE (= machineguns) is misspelled on decals as MFFRALIERE! On the underside, the placement for decal 12 is again wrong. It reads correctly PRIZA ELECTRICA (= electric connector) but it should be placed at the root of the opposed wing, where the actual connector is. Honestly, I’m baffled by this list of errors on an otherwise superb kit. (I hope nobody gets fired after this review). 2.7. A New releases flyer color printed on A4 glossy paper is also included in the box, presenting three new (for October 2016) very appealing Hobby Boss issues. A REALLY nice in depth review of one of my favorite, obscure AC. Too bad about the decals though. So, who will be the first after market company to offer correct markings ? Gotta add this one to the stash ! Thanks for sharing !